The Vatican probably haven't yet produced promotional posters for the Holy Father's trip to Sweden to commemorate the Reformation with Lutherans. They can have this one for free. The smoke of Satan has entered the fissures of The Vatican!50 yrs and counting.Remember that next year is the 100 th year since the Fatima apparitions and you can safely bet that Bergoglio will play down,or ignore Fatima(even if he goes there)in favour of the Protestant heretics and Lutheren scoundrals.God Bless. I seem to have missed the funny part - wait, I did give a wry smirk on it. I would like to suggest that this right on target "promotional" poster be made available to all Catholic bloggers to use for their "Remembrance of the Reformation". If used 'en masse" by the Catholic blogging community, it may well serve as a counterbalance to the ----- that our 'sorry' pope is espousing. It will certainly highlight the Reality of the Reformation. P.S. Re: "----", other readers can put their own word or words there. 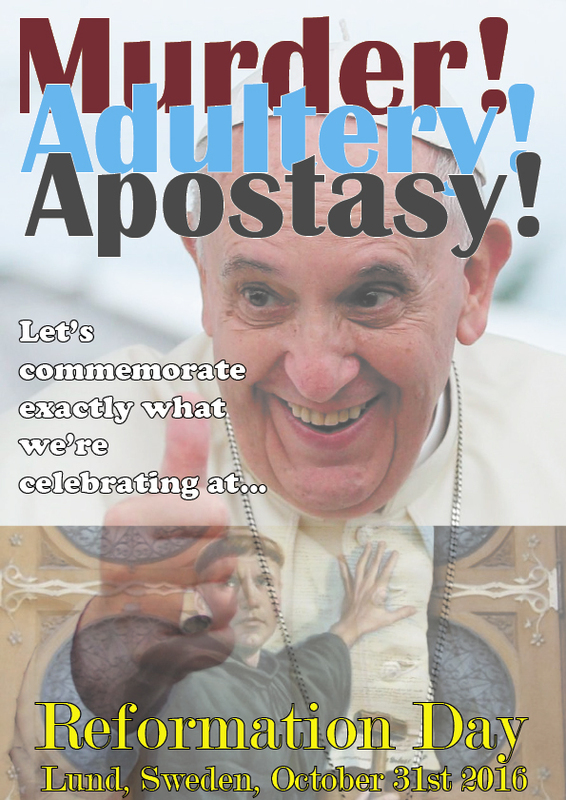 Why should Francis not celebrate his great fellow insulter, Luther? I love the Luther insult generator and of course the PF Little Book of Insults!